Shammal Qureshi arbeitet als Friseur im pakistanischen Lahore. Testen Sie hier Ihr Hörverständnis mit Erzählungen aus seinem Alltag. Shammal Qureshi is not your typical hairdresser. Listen to him talk about his profession and do the exercises to test your listening comprehension. You can open the transcript by clicking the text underneath the audio player — but we’d recommend to do the exercises without looking at the transcript. So what I realized when I got to Pakistan is that there is a big gap in vocational training. So, in Pakistan what happens is there is usually like a sensei/student kind of situation, where, like, one student will shadow a teacher, and then one day he just realizes that, oh, now I can cut hair. So when we came here ten years ago, the market was very different. There was absolutely no formal training for hairdressing, you know? It was literally, like, some guy saw another guy cut hair for, like, six years with his hands behind his back, and one day said, now I can cut hair, you know? So the standard of hairdressing was really, really low, and where in London it would normally take two months to train or retrain a hairdresser, we took, like, almost a year to train our first batch. Because, obviously, to get them to that standard. It was a profession which was looked down upon, you know? Like, maybe it’s reminiscent of the caste system or whatever it is that we brought with us from India, or whatever. It was, like, hairdressers are, like, lower. They are not seen as successful people, or whatever it is. So I wanted to kind of change that, you know? And I really wanted hairdressers to have, like, something to be proud of. Like, make it a profession for them to be proud of. The average income for a hairdresser was really, really low, like, you know? So what we did was, when I started my first salon, I said, “Look, people are willing to pay, you know, this much for a haircut. So we can’t charge very much more, so I can’t increase your salary very much, but this is my plan. And so they all got on board. They trained for one year, you know? We had very low salaries. I actually had no money to start, you know? So Juju, who you met outside, her first salary was, I think, 7,500 rupees. So she just got divorced, and she’s like, how am I going to live? I’m like, listen you guys don’t know how to cut hair, we’ve got to open the salon, I’ve got overheads, I thought I was going to train you for two months, I’m going to have to train you for almost a year now because it’s literally like starting from the beginning. So they all put their faith in me, and we started our first salon, and then slowly now these guys get paid, you know, good money, a lot of money. Juju has her own salon now. She’s partnered with me in Islamabad. Her kids are going to college to the UK. 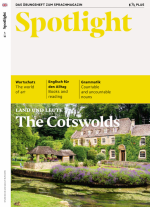 Diese Übung stammt aus dem Übungsheft Spotlight Plus 4/2019. Die ganze Ausgabe können Sie in unserem Shop bestellen. In Verbindung mit dem Spotlight-Magazin gibt es das Übungsheft auch günstig und bequem im Abo.